Thank you for visiting the online home of The Circus Sports Bar and Grill located in the historic Downtown Aberdeen, South Dakota. Step into our smoke free, family friendly atmosphere for a cold beverage and don't forget to take a look at our grill menu. Weekly specials can be found on our "Weekly Specials" page. Wondering what we've got going on? Don't forget to check out our "Upcoming Events" page. If its hot wings that you crave, give our world famous buffalo wings a try. We have a flavor for all wing enthusiasts. Do you think you have what it takes to conquer a double order of our "Nuclear" wings? Stop in and give them a try! 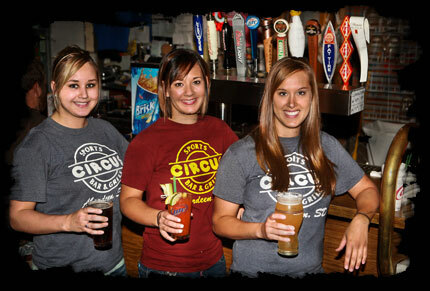 The Circus Sports Bar and Grill, a fun bar located conveniently just off of Main Street in downtown Aberdeen, SD (14 3rd Ave SE). Open Monday - Saturday 11am to 2am and Sunday 11am to midnight. The perfect gift for any wing lover! The Circus Sports Bar & Grill has the best hot wings in Aberdeen, SD! The Circus is a fun bar in downtown Aberdeen featuring delicious hand-pattied burgers and the best buffalo wings in Aberdeen! The Circus features 13 different beers on tap and a full cocktail bar. No wonder the Circus is known to locals as the best bar in Aberdeen, SD! Are you looking for the best burger in Aberdeen, SD? Circus Sports Bar & Grill! How about the best wings in Aberdeen, SD. Circus Sports Bar & Grill! Or maybe you are just looking for cool bars in Aberdeen, SD. Circus Sports Bar & Grill! Did we mention we have the best buffalo hot wings anywhere? Try them and see!